Yes, the title is not a typing error. How about having your own private Fiji island all to yourself? Discover how to, literally, have your own piece of paradise all to yourself! You've seen it in the movies (check out our Movie Fiji section) with Tom Hanks and the like, now it's available in Fiji. And if the reviews are anything to go on, it's better in real life. Just ask Mel Gibson. 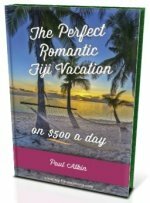 Even though over 200 of Fiji's 333 islands are uninhabited, you are not allowed to just pitch a tent anywhere. There's a tight relationship between Fijians and their land, so you cannot just wander willy nilly. Nor can you drop your fishing line in amongst all that fish or surf those sick waves in the distance. You need to obtain permission. Small secluded island paradise to rent one party at a time! You know what this means... you don't have to share the beaches, you don't have to share the lounge, and you don't even have to share the island... it's all yours! This is absolute privacy in absolute seclusion. There is another way. And that's to book the entire resort, which is widely offered. I didn't include this here, as I only wanted establishments that specifically cater for one-party-of-people at one time. This would surely be one of the most stunningly unique vacation destinations in the entire world. A 5-star luxury resort with it's accommodation perched on top of a cliff with perfect ocean views. Tucked away in the iconic Mamanucas, you will be doing it tough transferring from Nadi International Airport via helicopter. For more information, check out the Wadigi Island website. A remote wonder far away from the nearest island 15miles/25kms away. This marine and wildlife sanctuary is home to the likes of the fabled Hawkesbill and Leatherback turtles, giant clams on the surrounding reefs with native fishes, and some of Fiji's rarest birds. The 2 bures are no more than 10 steps to the sea and are amongst hundred's of year old coconut trees. For the adventurous, sleep outside on the sizeable deck, as you probably won't get an opportunity like that again. For more details go to their "Alone on your own island" website. Sometimes the cliche 'Once in a lifetime opportunity' is flung around a bit too often. However I'm sure you'll agree, a private Fiji island like these 2 is more than worthy.